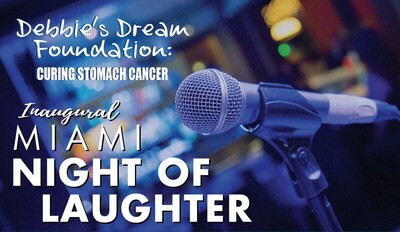 MIAMI, March 13, 2019 /PRNewswire/ -- Debbie's Dream Foundation: Curing Stomach Cancer (DDF) is excited to announce its Inaugural Miami Night of Laughter will take place on Sunday, March 31, 2019, at the Miami Improv at CityPlace from 2:00 p.m. to 5:00 p.m. The comedy show is one of DDF's signature events that take place annually in Fort Lauderdale and New York, and now in South Miami. In its first installment, the Miami event will help raise the necessary funds to support stomach cancer research, to raise awareness about the disease, and provide education and support to stomach cancer patients and caregivers worldwide. Guests will enjoy hilarious comedy from actor and comedian Carl Remi, raffles, and more! Miami Night of Laughter co-chairs Evan Berger and Jason Bloch look forward to hosting a successful event in Miami this year. "This is going to be an incredible event and I couldn't imagine a better cause," said Night of Laughter co-chair Jason Bloch. Tickets are $40 in advance and $50 at the door in addition to a two-drink minimum. This year's event sponsors include Stand Up Sponsor Goldman Sachs. Sponsorship opportunities are still available and include reserved seating along with other perks. Raffle tickets will be sold separately. For more information about the event, to become a sponsor, or to purchase tickets, please visit https://debbiesdream.org/events/10th-annual-night-of-laughter/, email Events@DebbiesDream.org, or call (954) 475-1200. DDF was founded in 2009 by Debbie Zelman after she was diagnosed with stage IV incurable gastric cancer in 2008 and given only weeks to live. Debbie is considered a pioneer by many for bringing awareness to the plight of stomach cancer patients worldwide and the lack of federal funding for stomach cancer research. She achieved all of this while receiving hundreds of rounds of chemotherapy in addition to daily oral treatments. Debbie passed away on December 23, 2017, at the age of 50, almost a decade later. As a result of her leadership, DDF now has a Scientific and Medical Advisory Board, comprised of world-renowned physicians, and chapters throughout the United States and in Canada and Germany. DDF strives to continue Debbie's mission and make her dream come true. To learn more about DDF, please visit us at www.DebbiesDream.org.